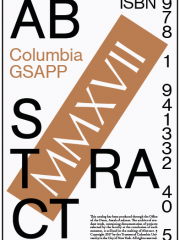 Abstract is the yearly publication of work and research from the Columbia University Graduate School of Architecture Planning and Preservation. Produced through the Office of the Dean Amale Andraos, the archive of student work contains documentation of exceptional projects, selected by faculty at the conclusion of each semester. The 2017 edition includes the applied research of the school’s laboratories and projects from design studios taught by Eric Bunge and Mimi Hoang, Kersten Geers, Juan Herreros, Steven Holl, Andres Jaque, Momoyo Kaijima and Yoshiharu Tsukumoto, and Laura Kurgan, Jing Liu, LOT-EK, Reinhold Martin, Umberto Napolitano, Kate Orff, Jorge Otero-Pailos, Rural Urban Framework, Hilary Sample, Bernard Tschumi, and Enrique Walker and many others. This volume is conceived as both an organizational model for the school and a testament to the global distribution of the work included within.